Is Barack Hussein Obama the AntiChrist? There are all kinds of wild accusations running rampant on the internet but the reality is that being both The Antichrist of the World and President of these United States may prove to be an unwarranted strain on Barack’s energies–notwithstanding the need for just compensation. Not that I have done it before, but ruling the world sounds a whole lot more taxing than playing charades with Cheney. 🙂 Later, I will attempt to take a serious look at the crazy internet claims, but first, let’s first consider our pressing political conundrum. What are we going to do on Tuesday, November 4, 2008? Please take the time to read the recent Alan Keyes World Net Daily (WND) article, “2-Party System – No Choice but Evil”. Keyes exhorts us not to be ruled by fear but be of sound mind and moral conviction as the election approaches. Easier said than done! Alan makes some rather challenging but apropos comments regarding the current presidential climate and our responsibility therein. Even Dr. James Dobson seems to be hedging just a mite from his rather emphatic statement uttered this past January, “Speaking as a private individual, I would not vote for John McCain under any circumstances”. I don’t for a minute question Dr. Dobson’s integrity or his motivations (since he has long proved to be a principled leader), but I do wonder about our collective resolve to stand against evil–since it is clearly not a respecter of political parties. My guess is that Dobson will reluctantly cast his support in favor of McCain. No one can or should deny another the right to change his or her mind in light of new information or a better understanding of the facts. Dr. Dobson may be correct when he cites a “constantly changing political context.” However, he presented his opposition to McCain as a matter of conscience, not political calculation. As Dr. Dobson wrote in an essay defending his position of conscience, “Polls don’t measure right and wrong; voting according to the possibility of winning or losing can lead directly to the compromise of one’s principles. In the present political climate, it could result in the abandonment of cherished beliefs that conservative Christians have promoted and defended for decades. Winning the presidential election is vitally important, but not at the expense of what we hold most dear.” (“The Values Test,” the New York Times, Oct. 4, 2007) From this perspective, the question is not whether the political facts have changed, but whether there has been a change in the moral truth that should govern conscientious choice. In this respect, the moral facts about both Obama and McCain were clear when Dr. Dobson first declared his position of conscience. Nothing has changed. We need to prayerfully consider our role in the upcoming election. Many issues are on the table. Do we “change” simply for change sake? Do we know where that change will lead? As you think through these things please also mull over your reaction and ensuing responsibility to the presumption that Barack Obama is THE Antichrist. Preposterous you say? Not so fast. I’m certain that I’m not alone in the receipt of such emails detailing the composition of this beastly character (the antichrist). Should we continue to propagate this kind of thing? Should we consider it a viable possibility? Since the election’s stretch run is going to be so emotionally charged, I think it is necessary for us to seriously consider what we do and don’t pass along to our e-buddies. Is it not our responsibility to confront this whole notion head-on with Scripture? Gary DeMar of American Vision has done just that in a recent blog article, “Hal Lindsey, Obama, and the Antichrist“. One thing we simply can’t afford to do is foster an even greater distrust of the Word of God based upon wild and crazy conjectures. There are lasting consequences when God’s Word is perverted. I don’t think it’s intentional but the damage has nonetheless been done when these emails proliferate unchallenged. It isn’t simply harmless fun when we don’t put an end to that which can be proved false. Excuse my English, but this sort of nonsense (I know that’s harsh but we have to call it like it is) totally ignores the Scriptural references regarding Antichrist. Although truth based upon sound interpretation has never short-circuited people from making similarly outrageous claims (further damaging the credibility of the inerrant Word), for the sake of the Gospel I don’t believe we should allow these kinds of claims to continue into perpetuity. At least not without serious and unintended side-effects. We must handle the Word of God precisely and without preconceived prejudice. Let’s dispel this irresponsible “Obama’s the antichrist claim” not because the man doesn’t fit the Biblical definition, but by applying consistent Biblical hermeneutics (the science of study). 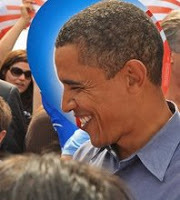 We know that Obama cannot be the antichrist. How? By resorting to God’s Word. But before we determine the “how” let’s create a Scriptural definition. Antichrist is only found in 4 verses, all from John’s epistles—and none from the Revelation. The Greek word Antichristos is anyone who is Christ’s adversary. Anyone who is anti-Christ. Let’s consider the Scriptural usages thereby creating a definition based on the Word not from some fictional book series. Now let’s put this in context and prove beyond a shadow of a doubt that although Barack Obama may be the worst and most dangerous presidential candidate to be a hanging chad away from the highest office in the land, he is not “THE ANTICHRIST”. How can we be so certain? Audience relevance. Scriptural context. There is no ONE person called the antichrist. (1John 2:18; 2:22; 4:3; 2John 1:7) — Those who oppose Christ are anti-Christ. The Apostle Paul was at one time an antichrist. Many false Messiah’s appeared in the first century between the cross and the destruction of the temple in 70 AD. For an absolutely breathtaking look at first century events surrounding the predictions found in Jesus’ Olivet Discourse (Mt 24; Mk 13; Lk 21), read the following written by Peter Hoford in 1805: The Destruction of Jerusalem: An Absolute and Irresistible Proof of the Divine Origin of Christianity—Including a narrative of the calamities which befel the Jews so far as they tend to verify our Lord’s predictions relative to that event. If you read this paper you will never again look at Bible prophecy with the same 21st-century glasses. There was a pervasive “spirit of the antichrist” that signified “the end of the age”. The antichrists referred to by John lived 2,000 years ago—their appearance marked the culmination of the “end times”/“last days” signified by John’s usage of “it is the last hour”. In conclusion, I hope we will dispel irresponsible statements regarding Obama or anyone else as being THE antichrist. I’m sorry if I may be perceived as offensive here, but the Word of God must not be prostituted to satisfy errant eschatologies. John tells us that the “Spirit of the anAntichristwas prevalent in the first century. That does not preclude people today from being anti-Christs, since anyone opposing the Gospel of Christ is anti-Christ, but no one this side of the first century destruction of Jerusalem is a Biblical fulfillment of John’s statements. I also hope that we can gain God’s mind on how we can best fulfill our stewardship of being ambassadors to the Kingdom of Christ. Should opposition to Obama drive us to McCain? If the Christian community ever became united in purpose and commitment to Christ there’s no telling where our world would be. This entry was posted in 2nd Coming, Antichrist, Apocalypse, Eschatology. Bookmark the permalink.